This week we're going to take a look at Core Data behind the scenes and examine the database that is automatically created for you the first time you try to retrieve entities. If you don't have it already, you can get a copy of the latest project from this link. In the Finder menu, click Go, and then hold down the option key. This adds Library to the list of folders as shown in Figure 1. Figure 1 - Hold down the Option key to add Library to the list of folders. Next, drill down into the Developer folder, and then down into the CoreSimulator > Devices folder. 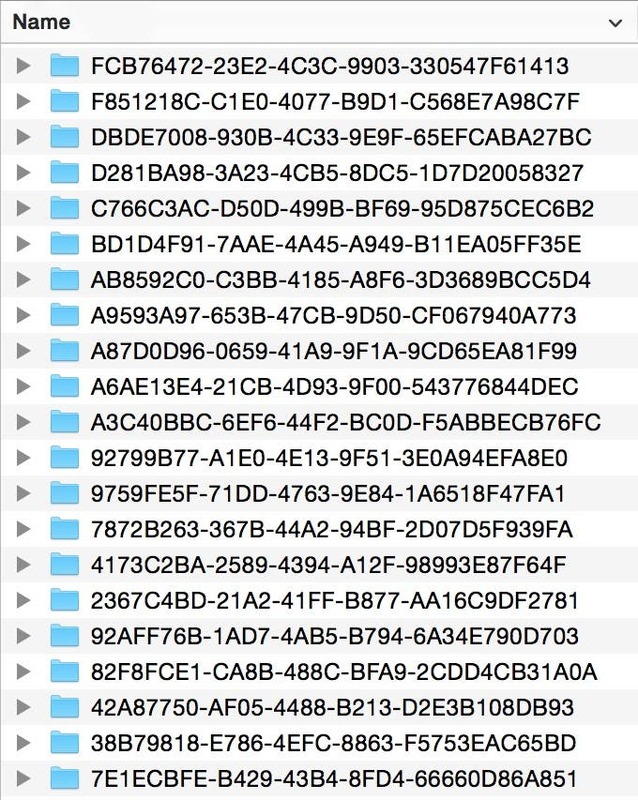 You will see multiple subfolders with unique ID names, one for each version of the iPhone Simulator you have installed on your Mac (Figure 2). To get to the actual app files you have to drill down even further. However, the Devices folder is a good mid-point when searching for Simulator files, so I recommend dragging this folder to the Favorites bar on the left side of the Finder window for easy access. To make it easy to find your app's Simulator files, I have added a line of code to the mmBusinessObject's applicationDocumentsDirectory computed property that displays the location of your app's SQLite database file in Xcode's Console when you run the app in the Simulator. To see this code in action, click Xcode's Run button. In the first scene, select Write a Review, and then in the Write Review scene, select App Category. Afterwards, check the Xcode Console (Figure 3). Figure 3 - Your app's Documents directory is displayed in Xcode's Console. 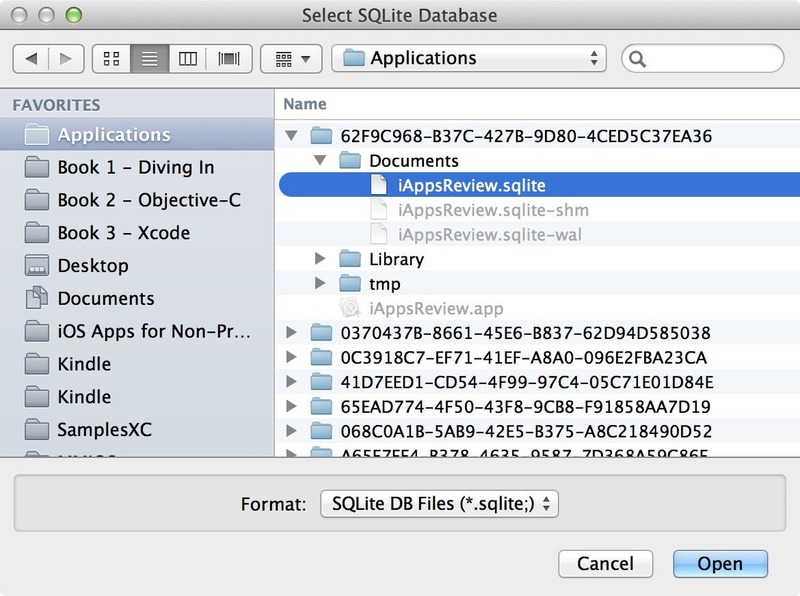 To navigate to this folder, go back to Finder, click on the Devices shortcut you created a few steps back and then drill down into the folders listed in the Console until you reach the Documents folder where you can see the SQLite files (Figure 4). The primary file has a .sqlite extension. To examine the contents of the file, you need a special app, which is discussed in the next section. I have found that one of the best tools for viewing a SQLite database is the SQLite Manager add-on for the Firefox web browser. I'll show you how to get this tool on your development machine. After Firefox successfully launches, go to the Firefox Tools menu and select SQLite Manager. This displays the SQLite Manager window (Figure 5). To open the app's SQLite database files, click the Connect Database toolbar button at the top of the SQLite Manager window (Figure 6). On the left side of the Select SQLite Database dialog, click the Devices folder you added to Favorites in the previous section. On the right side of the dialog, drill down into the Documents folder that was displayed in the Xcode Console when you ran the app in the Simulator and select the .sqlite file (Figure 7). 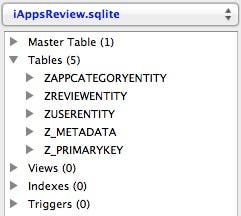 Figure 7 - Select the iAppsReview.sqlite file. Click Open to display the SQLite files in the panel on the left (Figure 8). You don't need to know all the details about what each of these tables does. In fact, one of the main goals of Core Data is to hide these details from you. However, it's good to have a basic understanding of the underlying mechanics in case something should go wrong. 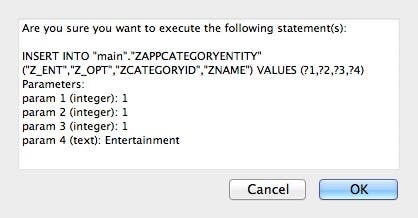 There are three tables, ZAPPCATEGORYENTITY, ZREVIEWENTITY, and ZUSERENTITY that have the same name as the entities that you added to the entity data model, but with a Z prefix. Expand the table nodes and you will see the columns shown in Figure 9. 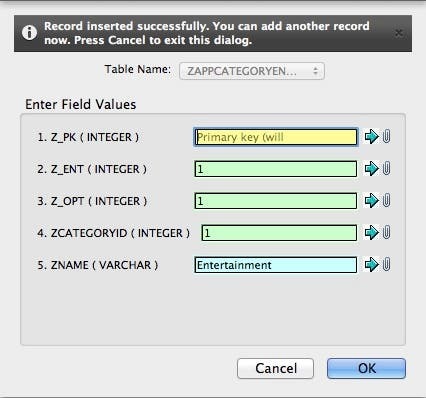 Z_PK is the primary key (unique identifier) for the entity, Z_ENT is the entity ID (every entity of a particular type has the same entity ID), and Z_OPT indicates the number of times an entity has been changed (starting with 1 when it is initially added to the database). All the other columns are attributes you added to the entities in the entity data model with a Z prefix. Let's add records to the database so that we can have something to view in our app. 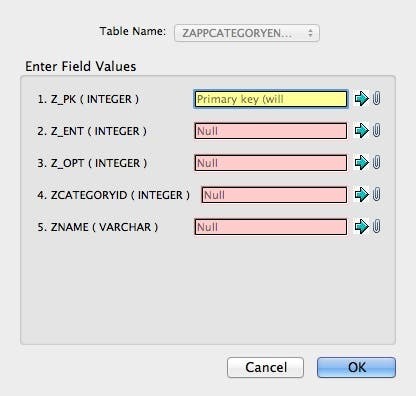 In the panel on the left in the SQLite Manager, click on ZAPPCATEGORYENTITY to select it. Then, on the right side of the panel make sure the Browse and Search tab is selected, and then click the Add button. This displays the dialog shown in Figure 10. 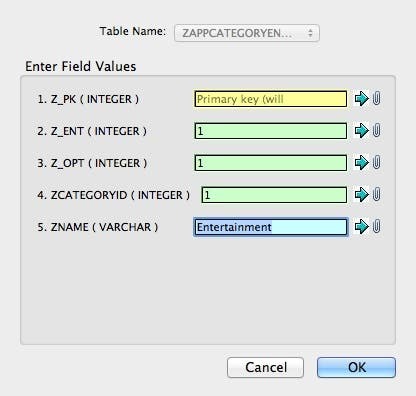 Enter 1 in the Z_ENT, Z_OPT, and ZCATEGORYID boxes, and in the ZNAME box, enter the text Entertainment as shown in Figure 11. Click the OK button. This displays the confirmation dialog shown in Figure 12. Click the OK button to add the new record to the database. When you do this, the New Record dialog is redisplayed with a confirmation message at the top as shown in Figure 13. As stated in this message, if you press Cancel, you will exit the dialog. Otherwise, you can add another new record. Figure 13 - Record inserted successfully! To add the next record, press the tab key until the ZCATEGORYID box has focus and its contents are highlighted (without changing any other values). Type the number 2, then tab to the ZNAME box and enter the text Games (which deletes the existing text) and press OK. In the confirmation dialog, press OK to save the record. Now let's add just one more category record. Tab down to the ZCATEGORYID box again, and this time enter the number 3. Next, tab to the ZNAME box, enter the text News, and click the OK button to save the new record. Afterwards, press Cancel to exit the dialog. At this point you should now have three app category records in the database. Now that you have app category records in the database, let's run the app again and see how this data looks at run time. At the top-left corner of the Xcode window, set the scheme to iPhone 6. When the app appears in the Simulator, click the Write a Review row at the top of the iAppsReview screen. Click the App Category row at the top of the Write Review scene and the app will crash with an error displayed in the Console (Figure 14). Figure 14 - A Core Data error! The error in the Console tells us that Core Data was unable to load the AppCategoryEntity class. What's going on? I allowed you to get this error because you're going to experience it in your real-world app development. Fortunately, it's an easy fix. Go back to Xcode and click the Stop button. In the Project Navigator, select the iAppsReview.xcdatamodeld file. On the left side of the entity data model, select AppCategoryEntity. On the right side of the Xcode window, select the Data Model Inspector. In the Class box, add "iAppsReview." (include the period) before the AppCategoryEntity name as shown in Figure 15.
iAppsReview is the project's module name, and Core Data needs this information in order to load the entity from the SQLite database at run time. Oddly enough, you need to leave the module name off when generating an entity class from the model, but you need to add it in before running the app. This is one of those "gotchas" that isn't really covered well in Apple's documentation, but is something you need to know when working with Core Data! While you're here, you need to add the module name to the other entities in the entity data model. To do this, just select each entity, go to the Data Model Inspector and add the iAppsReview. prefix. Now you're ready to try running the app again. Click Xcode's Run button, navigate to the Write Review scene and select the App Category row and you should see the three categories you entered in the database as shown in Figure 16! If you are like most people, it's pretty exciting to see the app displaying entities that it retrieved from the database on the device. Figure 16 - The app categories at run time! At this point you have done much of the work necessary for adding Core Data to the iAppsReview project. In my next post we will enhance the project to create and update other entities and I'll even show you how to ship a database with your app so that your users have a database pre-populated with data.